Nordic Cuisine can be a little challenging for outsiders. Ingredients like smoked salmon, pickled herring, and fish roe are not as common worldwide. Over the past few years, appreciation for the Danish culinary scene has developed rapidly. World-renowned Danish restaurants, like Copenhagen’s Noma, have embraced the farm to table movement, local ingredients, and sustainability. Nowhere is this revolution more evident than with the Danish staple Smorrebrod. 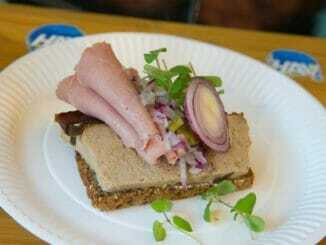 At first glance, Smorrebrod, or Danish open sandwiches, seem a bit strange. The phrase open sandwich is, in itself, almost oxymoronic. However, the food could not be simpler. Literally meaning “buttered bread”, Smorrebrod, takes the best of Danish cuisine and makes it accessible to even the pickiest eaters. To help explain the concept, I often compare Smorrebrod to Sushi. Of course, the flavors and elements vary tremendously. In terms of simplicity and artistry I find the two very similar. It was not long ago Sushi was considered “exotic” or “strange.” Now Sushi has expanded into the worldwide culinary vocabulary. The basis of any good Sushi roll is the rice. The rice ties the roll together, gives it substance, and is meticulously prepared. With Smorrebrod, it’s all about the bread. The rugbrod, a dark, dense sourdough rye, literally supports all the other flavors of the sandwich. The bread must toe the line between soft and firm. It balances the nutty rye flavor with an unlikely smoothness. Top it with a little melted butter and the beginnings of Smorrebrod don’t seem so weird after all. The next step is the “filling” of the sandwich. In sushi, likely ingredients are Pacific catches like crab, tuna, or eel. 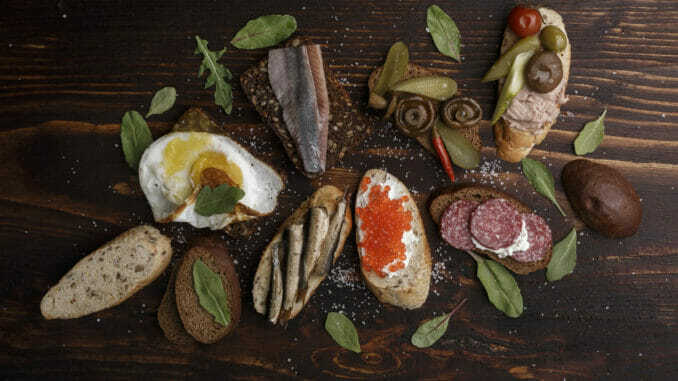 Smorrebrod puts the North Atlantic on display with salmon, herring, and small shrimp. 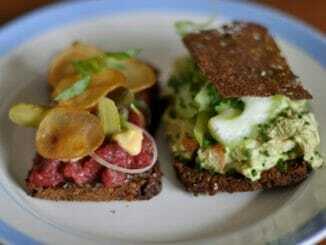 These are affordable and accessible nettings that allow Smorrebrod to be a food for all Danes. They are much easier to work with, and carry distinct tastes. The salmon is often smoked making it smooth and rich in both flavor and texture. The herring is usually pickled, sometimes curried, and is a salty treat for the truly adventurous. The tiny shrimps are boiled and used as topping providing a luxurious finish to the sandwich. Smorrebrod is not exclusively seafood. Heavily salted roast beef and pork are often featured in the heartier versions. There are endless varieties and combinations of ingredients only limited by the imagination of the chef. Lastly are the toppings. Consider these the equivalent of soy, fish, or eel sauce in Sushi. Common finishing elements in Smorrebrod are mayonnaise, cucumber, dill, red cabbage, red onion, leverpostej (liver paste), egg, and many others. Again the creativity of the chef is responsible for all these delicious ways to accentuate the flavors of the bread, and protein. Smorrebrod is a feast for all the senses. Presentation and smell are just as important as taste. Just as sushi chefs take great pride in their creations, makers of Smorrebrod painstakingly plate every element. This is a matter of national pride and purpose. Everything comes together to create a unique cultural experience. Around Nyhavn there is the quaint Brooklyn Bar. Here you’ll find old school service and charm. The bathroom is small, the seating is cramped, but the food is made with joy. Watching the proprietor prepare your food just feet away is a true pleasure. You can request a mixture and they will bless you with a massive spread for a decent price. In this heavily touristic area, it’s incredible to see a family owned restaurant still doing things the old way, the right way. Here you can see the art of Smorrebrod in action. Around Vesterbro/Tivoli you can find a Smorrebrod joint of a completely different nature. If Brooklyn Bar is proof the old way still gets it done, Ol & Brod shows that everything can be improved. Ol & Brod, Danish for beer and bread, has mastered those simple necessities through innovation and creativity. This new restaurant is operated by Danish craft brewing legend Mikkeller. Mikkeller is famous for splicing fresh ingredients into tired beer clichés. Here they bring the same attention and ingenuity to Smorrebrod. Next-door to the iconic original Mikkeller bar, and located in hip Vesterbro, Ol & Brod brings Smorrebrod into the 21st century. Expect great beer, fantastic food, and modern art to coalesce into an unexpected Smorrebrod experience. Around Indre By (city-center) but a bit off the beaten path is the classic Restaurant Schonnemann. If there is one classic Danish eatery, this may be it. When dealing with the classics, it’s best to eat them at a classic place. Wood paneling, white tablecloths, and a well-dressed wait staff, make you wonder why Ol & Brod wanted to re-imagine anything. At Schonnemann, you get to taste Copenhagen’s old world charm. Located close to Norreport and Copenhagen’s tourist center, but tucked off discretely on a side street, Schonnemann is a place for the well informed or the extremely lucky. They like it that way, and I think you will too. So don’t be intimidated by Smorrebrod or Danish food in general. Copenhagen is located on an island so their food represents the scarcity and self-sufficiency that accompanies island life. 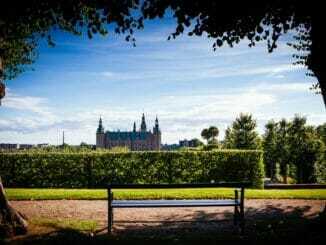 For thousands of years, Danes have made do with what they have. They’ve created a completely individual approach to dining and eating that is just now being appreciated. So next time you see Smorrebrod, imagine it like an unrolled piece of North Atlantic Sushi and take that first bite. After that, you too will be hooked.